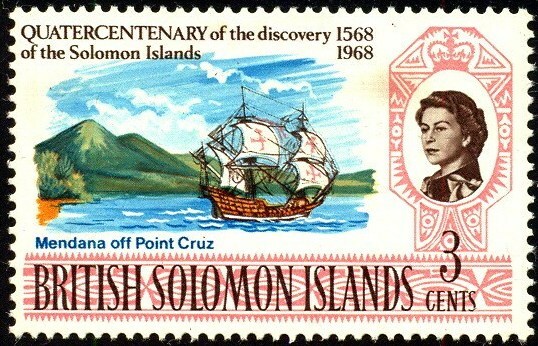 From 1567 to 1568, Alvaro de Mendana, the 25-year-old nephew of the Governor of Peru, led the first European expedition into the South West Pacific. Previous Spanish navigators had sailed west from Mexico, following courses north of the Equator towards Asia. 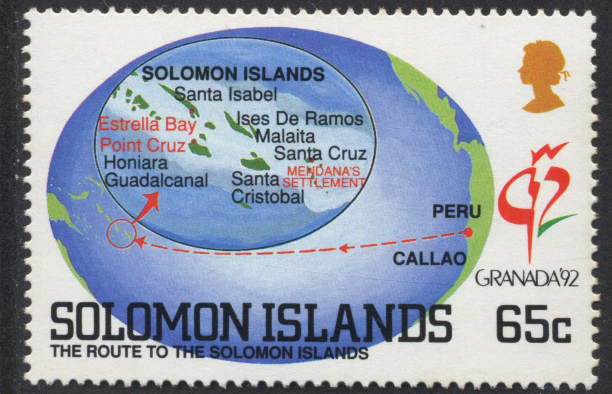 Mendana, by contrast, sailed from Callao in a south-westerly direction, searching for islands believed to exist 600 leagues from the Peruvian coast. Incas were said to have visited the islands and brought back ‘gold and silver, a throne made of copper, a multitude of black slaves and the skin of an animal like a horse’. The two ships, the 200 ton Los Reyes (the Capitana or flagship) and the 140 ton Todos Santos (the Almiranta or secondary ship) sailed from Callao, in Peru on 20 November 1567, with about 150 sailors, soldiers, priests and slaves on board. 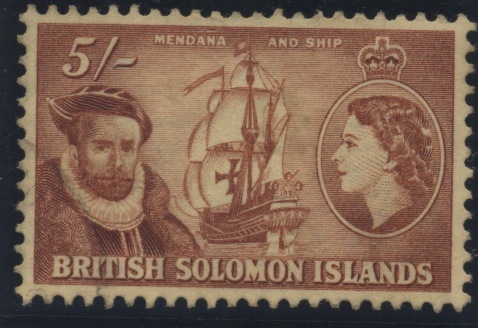 In February 1568, after a voyage of three months, the Capitano and the Almirante reached islands that the Spaniards were later to name the Solomon Islands. 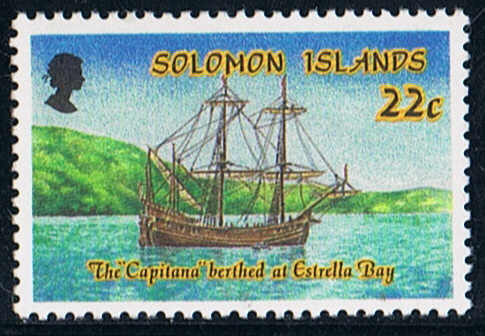 Mendana and his crew, together with 70 soldiers and four Franciscan friars, used as their base the island of Santa Ysabel, named after the patron saint of the voyage. 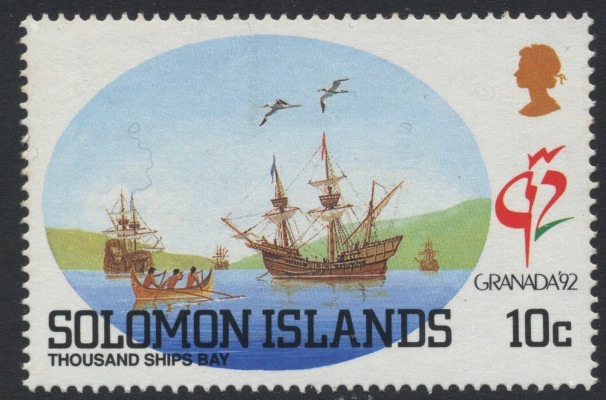 They spent several months exploring the islands, including San Christoval, Malaita and Guadalcanal, as well as bartering and fighting with the islanders. Mendana had orders to form a Spanish settlement and, had he done so, it is likely that the Australian coast would soon have been discovered. However, in August 1568 he decided to return to Peru. 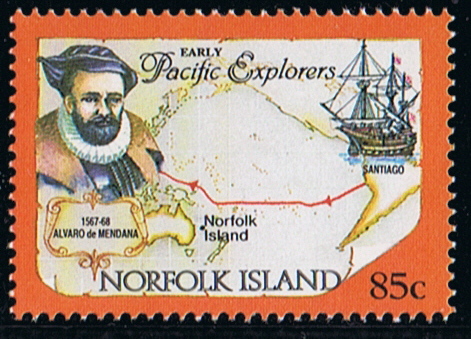 He sailed northwards through the Gilbert Islands and eastwards to the Californian coast, eventually reaching Callao in July 1569. 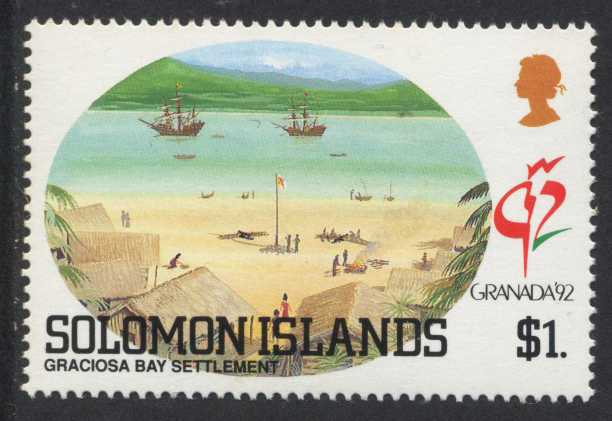 Two centuries were to elapse before another European, Louis de Bougainville, re-discovered the Solomon Islands. 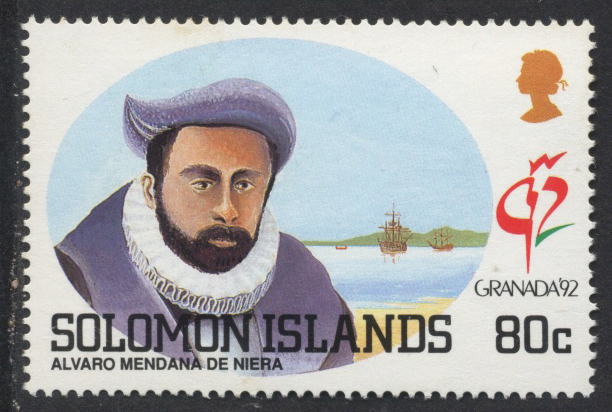 In 1595 Mendana made a second Pacific voyage, discovering the Marquesas Islands. He died at Santa Cruz and command of the expedition then passed to the pilot, Pedro Fernandez de Quiros. 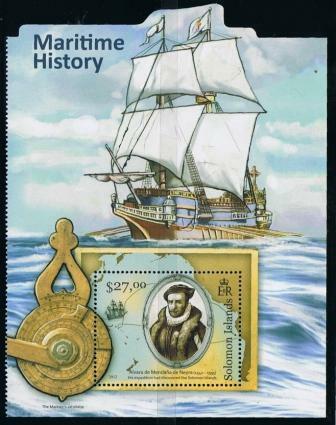 Is given by Watercraft on stamps and Stanley Gibbons as SANTIAGO, but Alvaro de Mendana never has used this ship on his expedition in 1567, he sailed on the LOS REYES his flagship, and more possible she is depict on the stamp. 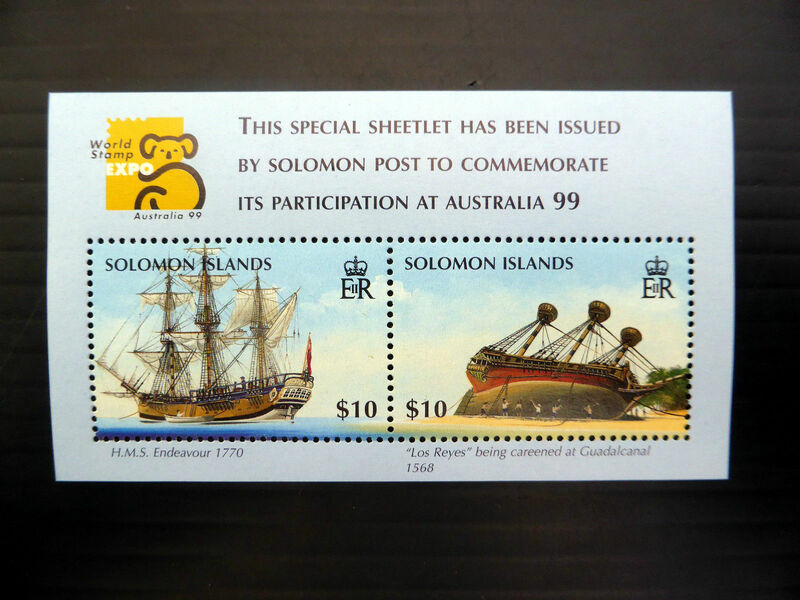 Norfolk Island 1994 85c sg569, scott559. Solomon Islands 2012 $27 sg?, scott? 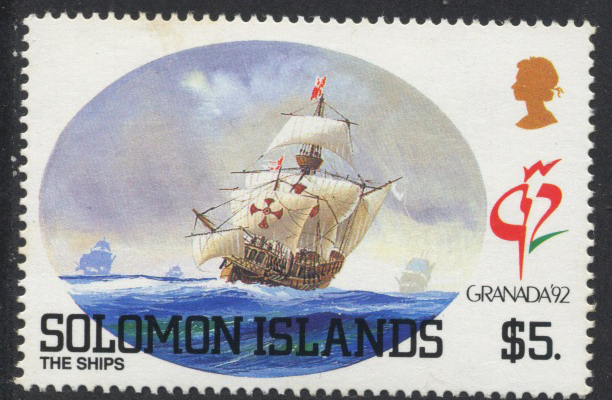 British Solomon Islands, 1968, S.G.?, Scott, 176.